The Catu Bicycle Basket from Basil can be utilised at either the front or rear of any bicycle. This mesh bicycle basket fits all kinds of luggage carriers, making it easy to install in moments. 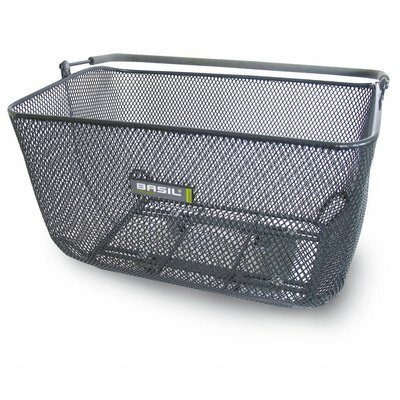 This fine-mesh bicycle basket is a practical choice for any cyclist. Made from sturdy steel with an edgy black finish, this basket is a stylish addition to your bicycle. It’s hard-wearing nature also means you can use it for all manner of applications. Perfect if you’re after a basket that you can turn to every day. Perfect for quick trips to the store for a few essentials, and sturdy enough to carry a hearty load of shopping bags if you’ve hit the sales. It’s also a great option for school-age cyclists who need somewhere to stow books, lunches and stationary. This basket measures 40 x 30 x 21 cm, meaning you’ll never struggle to accommodate your everyday essentials. 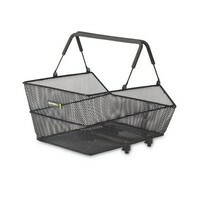 This basket offers plenty of unique features, including the TÜV approved Bas Solid Carrier System with lock. This patented system comes already assembled, with an adjustable width so you can anchor your bike to almost anything when you’re looking to lock up. In addition to all of this, this Catu basket is completely removable, meaning you can pop it free of your frame and venture into a store or meeting point with it as a handy storage solution while you’re on your feet. A quality basket that will hold up well for years to come, this essential storage solution is bound to impress. Looking for something more colourful, or need a basket in a different size? Browse the complete Basil range today and find exactly what you’re looking for. Attaches to front or rear of bike frame. Includes Bas Solid Carrier System. Fits almost every type of luggage carrier.